Ticket prices range from $19 (all ages) to $49 for our more advanced courses. Wild Blue Ropes is the first of its kind in the Lowcountry. This ropes course is designed to test you mentally and physically, challenging you to make decisions that seem simple from the ground, but not so much when you’re 35 feet in the air. Your typical ropes course may consist of a few telephone poles with a handful of routes to tackle. Wild Blue is a complex system of ropes, cables, and structures spanning across 2 acres of James Island. There are over 70 different routes to navigate throughout the course, ranging from easy to difficult. It can be a little intimidating from the top of the course. Thirty-five feet may not sound too terribly high, but once you’re standing on one of the 4 foot wide platforms on top of a telephone pole, 35 feet becomes quite a long way down, indeed. Even so, Wild Blue does an excellent job explaining how their climbing technology works, and demonstrating how to maneuver once up in the air. The harness system that connects you to the course is state of the art. There is a system of keys located before each route that lock one of the carabiners attached to your body harness onto the cable, and allow the other carabiner to open freely, allowing you to connect to the next route after completing a prior one. Long story short, once you walk up the stairs to the first platform and lock your first carabiner onto the cable, the only way you can disconnect is with a special key the instructors carry. It’s quite comforting knowing that there is literally no other system of climbing technology more advanced than the one Wild Blue uses. This is a fantastic place to round up a crew and try something completely new and exciting. 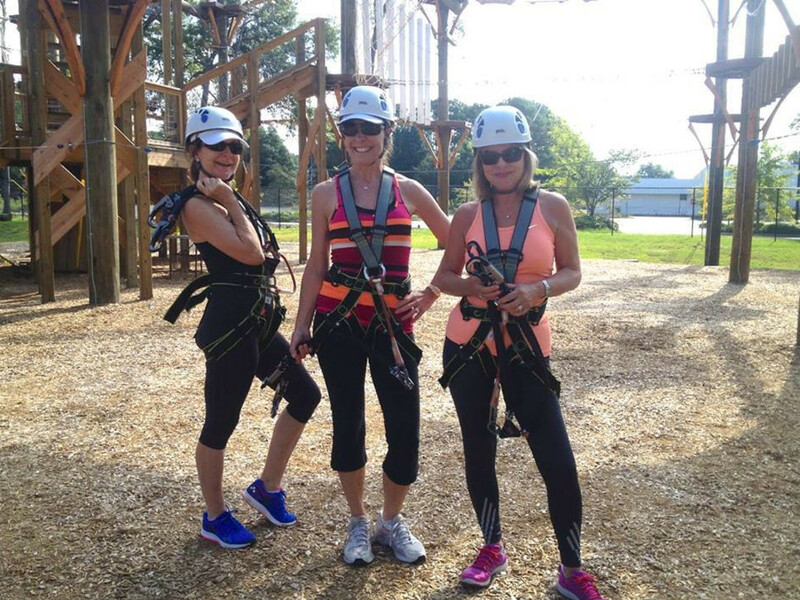 Climb with your friends, drop the kids off and let them explore up in the air, or take the office here for team building exercises. Want to climb at night? Wild Blue offers that as well. They equip you with a Petzl and give you free reign of the course. If you think climbing during the day is fun, wait until you try it at night. Getting to the course is simple. From downtown Charleston, take the James Island Connector, and turn left onto Folly Road. Go a couple of miles and Wild Blue is on your left on Highland Avenue. Rates are extremely reasonable, and there are plenty of ways to take advantage of the course, like parties, night climbing, etc. This is an incredibly fun way to spend a day, and Wild Blue’s close proximity to downtown is just gravy. Not to mention the staff is super friendly, extremely well-trained, and make you feel right at home—even if heights are your worst nightmare.